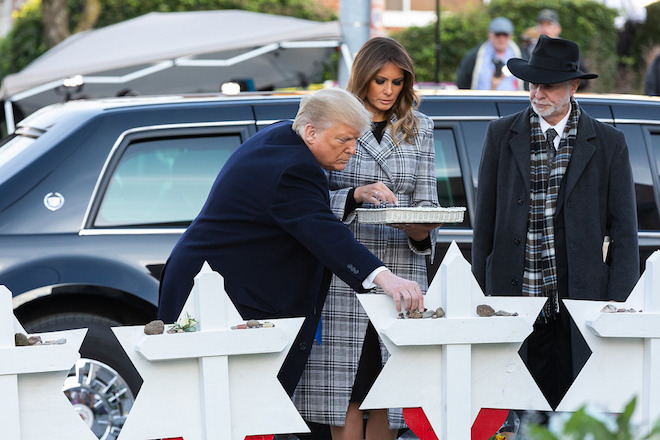 President Donald Trump and First Lady Melania Trump visit a memorial outside the Tree of Life Synagogue in Pittsburgh. Saturdays are a day of rest in the Jewish faith, a day in which Northwestern Hillel Executive Director Michael Simon would typically be at services. However, on this particular Saturday, he was mingling with families before the football game. He was talking to a family when someone pulled out their phone and asked, "Have you heard this news?" Simon looked at the phone, and learned there had been an attack at a synagogue in Pittsburgh. "My immediate reaction was, [how] this is such a horrible thing for the people who had family members killed, for the people who experienced the attack, for the law enforcement that had to confront it and for the community that has just been ripped away from their peaceful normalcy," Simon said. "Shabbat is almost like an illusion of a peaceful world, and that illusion was just completely shattered by this attack." On Oct. 27, a man entered The Tree of Life Synagogue in the Squirrel Hill neighborhood and killed 11 people. The suspect has since been indicted on 44 charges. On Oct. 29, Northwestern Hillel hosted a vigil in honor or the victims of the attack. Safety was Hillel's top concern after hearing about the attack, Hillel President Andie Linker said. NUPD reached out to Hillel following the attack to let them know that they would be working with them to ensure campus safety. Working with chaplains, religious and spiritual leaders, Hillel made sure to include many voices in the vigil and to focus on the victims of the attack. They also worked to provide a space for people to offer songs and prayers of healing. Weinberg freshman Jacqueline Olson said Jewish people have been persecuted and pushed out since the beginning of time. “This attack shows that even in a country that's supposed to have religious freedom, [anti-semitism] is a still a current problem,” she said. Medill freshman Zack Cherkas said he believes Trump’s rhetoric has contributed to an intolerant society. "He's just very degrading," Cherkas said. "We think it’s okay to treat one another based on how we see our government treating people. I think we need to realize as a society that that's not okay. It never has been okay, and it never will be okay." Cherkas also noted the sadness of having to worry about ones’ safety in a synagogue. Linker said she believes we need to openly start talking about the hatred inflicting our nation, and that when attacks like this happen to a community, all communities must stand up together and join hands. Editor's Note: Andie Linker is a member of NBN's print magazine staff.